Most cities and towns monitor their air quality, but it’s usually only in a few spots and doesn’t alert us to dangerous locations where pollution may be higher. Wanting to have a better understanding of air quality and health, the National Institute of Health along with other government institutes awarded a $100,000 grand prize through the My Air, My Health Challenge to a new wearable air pollution and health monitoring device. The Conscious Clothing system tracks particulate matter, measures breaths and can transmit the data via Bluetooth. With more data on air quality in specific locations, we can gain a better understanding of pollution, its effect on health and how to improve our environment. Monitoring air quality and pollution is becoming ever more important as our cities get bigger and more people live in urban environments. Often, unbeknownst to us, we are breathing in lungfuls of bad air, which affects allergies, asthma and much more. The My Air, My Health Challenge sponsored by the National Institutes of Health, the Office of the National Coordinator for Health Information Technology (ONC) of the U.S. Department of Health and Human Services, and the U.S. Environmental Protection Agency (EPA) aimed to find new technology to help improve air quality and health. The Conscious Clothing system designed by David Kuller, Gabrielle Dockterman, and Dot Kelly is the grand prize winner of the competition. 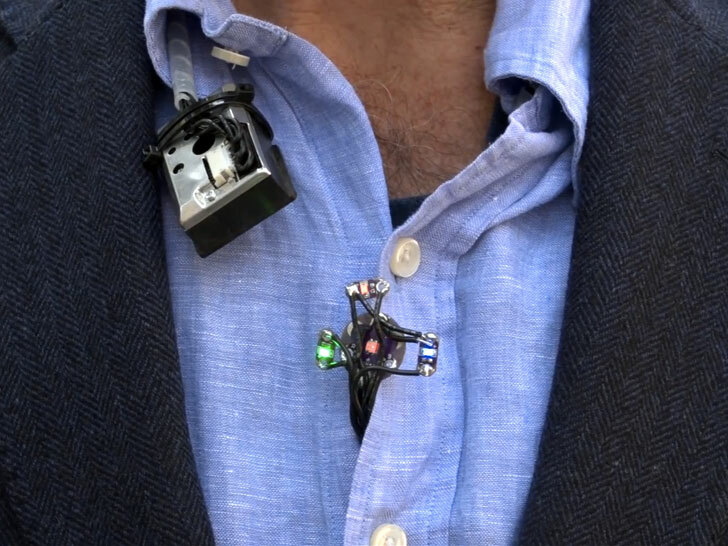 Strapped to the wearer’s chest, the wearable device measures particulate matter, while stretchy strips of knitted silver material wrapped around the ribcage measure breath volume. This data – breaths in vs air quality gives an indication of how much pollution we are really exposed to. Most cities and towns monitor their air quality, but it's usually only in a few spots and doesn't alert us to dangerous locations where pollution may be higher. Wanting to have a better understanding of air quality and health, the National Institute of Health along with other government institutes awarded a $100,000 grand prize through the My Air, My Health Challenge to a new wearable air pollution and health monitoring device. The Conscious Clothing system tracks particulate matter, measures breaths and can transmit the data via Bluetooth. With more data on air quality in specific locations, we can gain a better understanding of pollution, its effect on health and how to improve our environment.